Proper & Son is a handsome new market deli and cafe within South Melbourne Market. The space brings a bit of the country to the city, with modern white subway tiles offset by a provincial-style patterned wallpaper cleverly disguising chickens, pigs and cows. 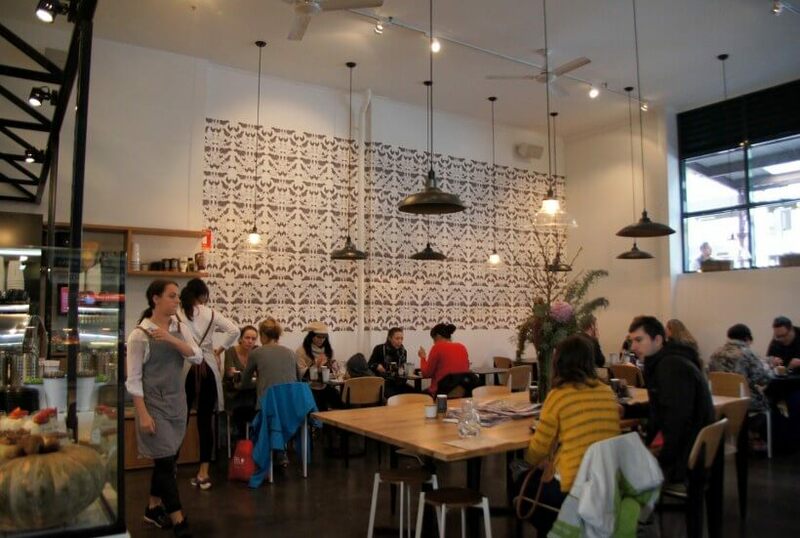 The stylish cafe seats around 35 people max and at around 10am on Sunday there was a short lineup before a table become available. Once we sat down everything was brought us promptly. All the food is made on site (breakfast until 11:30am, lunch from 11:30am) and the owner Eugene Lavery is also behind the stove. A owner-chef tends to bode well for the quality of an eatery, as he/she will really care about what comes out of the kitchen and how the service is managed. Given Proper & Son’s location it has the privilege of being able to change the menu weekly depending on what’s in season and what’s available within the market. So you can be assured that all the produce is as fresh as fresh can be. As we were visiting on Mother’s Day we tried their special ‘Proper High Tea’ menu where we received a hot beverage and a selection of sweet and savoury treats for $20. 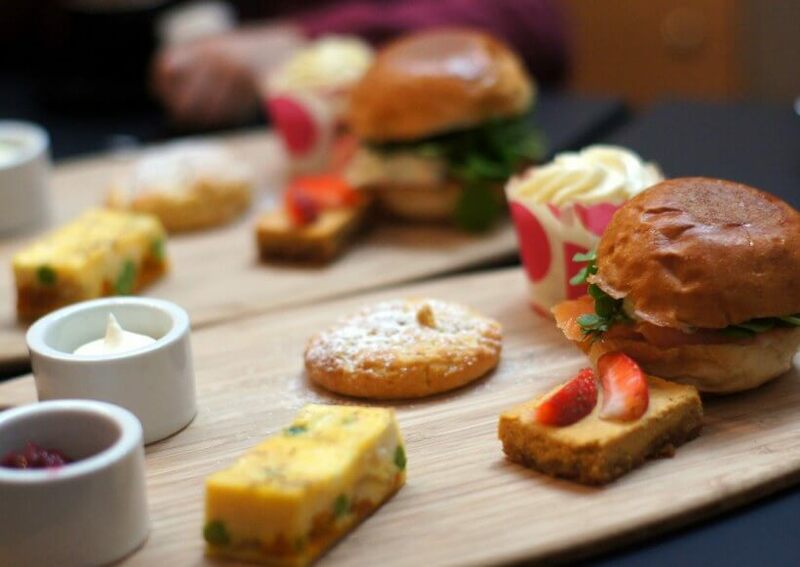 Half the fun was discovering what was presented on the wooden platters – a fat brioche bun with smoked salmon and dill, a slice of creamy pumpkin frittata, a rosy coconut cupcake and some sort of fudgy chocolate brownie. The only disappointment was the flat disc of a scone, though it was served with some delicious house made preserves and cream. The creamy coffee was made with Toby’s Estate beans and my hot chocolate was by Mork Chocolate. 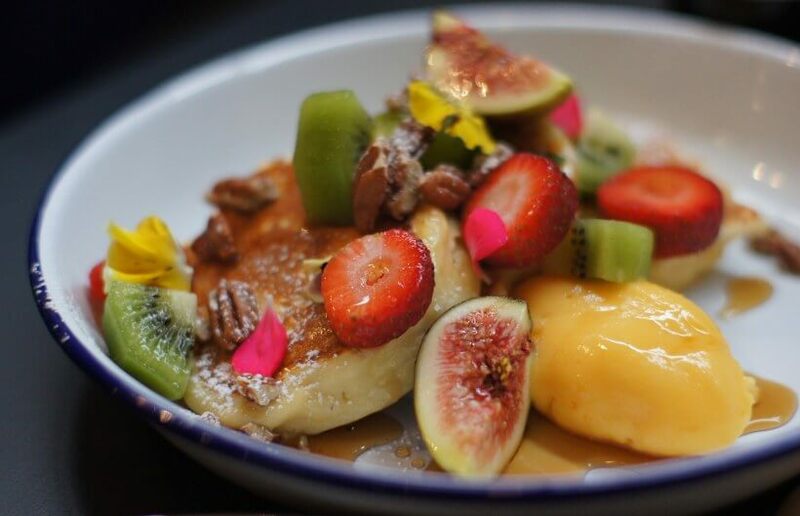 In addition we ordered the buttermilk hotcakes, a substantial dish of three fluffy pancake rounds heaped with fresh fruit, pecans and a huge ball of lemon curd ($13.50). A peek at our neighbours indicated that serving sizes seemed to be in on the generous side overall. For lunch Proper & Son turns into a carvery, with roast meat rolls made to order and a selection of four fresh salads. I’ve heard lots of raves about their ‘Market Roast Roll’ made with free range roast chicken with a sage, onion and cranberry stuffing or corned wagyu brisket with pickles, cabbage and mustard. 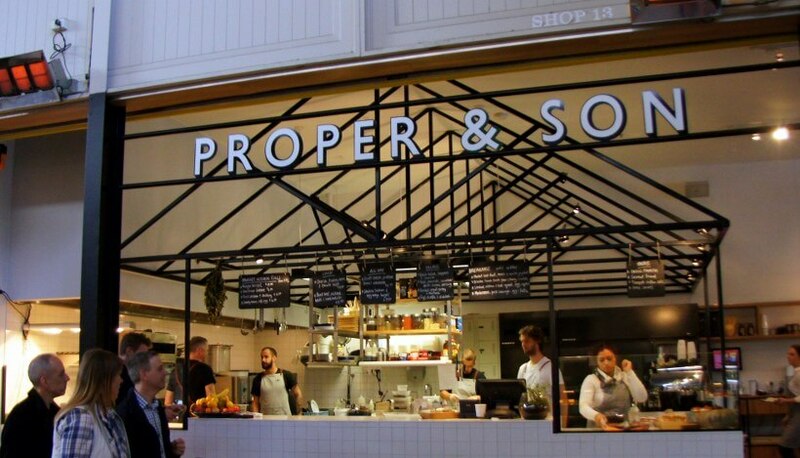 Proper & Son is an exciting addition to an otherwise lacklustre food court in South Melbourne Market and you could visit it weekly without eating the same thing twice. 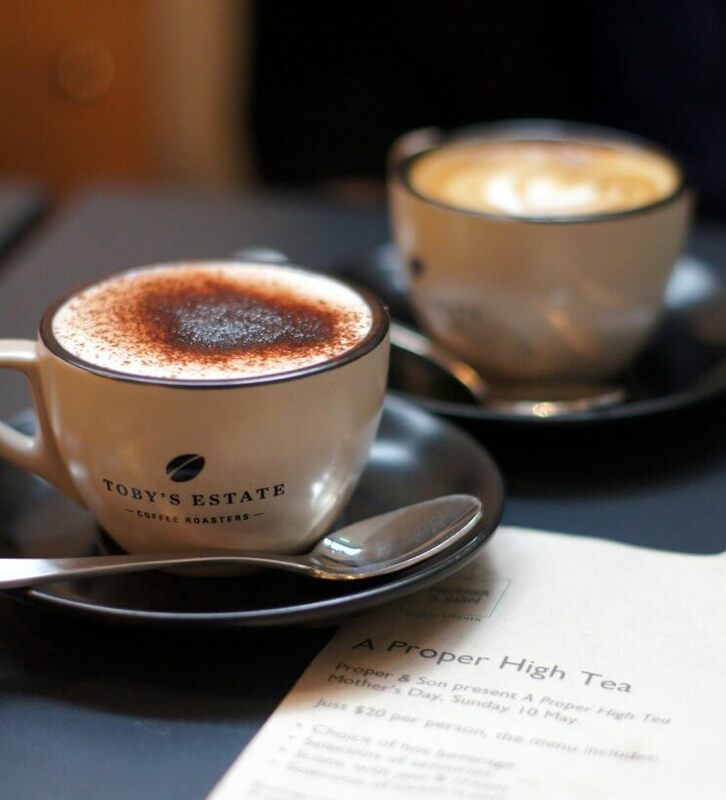 It’s a great place to stop with before or after your shopping.